Facebook has shown me a sponsored link of John Oliver criticizing the practice of electing judges. He shows campaign ads where criminals claim that a judge let them go. This appeals to voters who are afraid of criminals being free on the streets. He shows instances where corporations have contributed to PACs, which sponsored ads against judges. He shows an instance of an elected judge who was found to have engaged in personal, lewd misbehavior. He also shows an elected Alabama judge who says something that John Oliver, who is not an attorney, thinks does not hold water legally. I hope that the bar will respond to this distorted piece of editorialism. Unfortunately, most attorneys lack the charisma and wit of John Oliver, and may not be able to achieve the kind of widespread attention that he gets. Let’s start with the Alabama judge, who defied the Supreme Court decision. Now, let me make this clear. I am a supporter of marriage equality. Still what the Alabama judge says is not as stupid as what John Oliver implies. John Oliver is British, apparently, so he may not understand certain aspects of US law. The US constitution has always been a document that limited government power. The federal Supreme Court is supposed to be limited in how much it can intervene in state law. 1. The commerce clause, which allows the federal government to regulate interstate commerce. Curiously, in the case of marijuana legalization, it has been conservative judges, who did not want to intervene in internal state law, who have been more concerned with federal intervention in state regulation of intrastate commerce in the case of this drug, which we commonly associate with liberal hippies. It is the fourteenth amendment which is at issue with marriage equality rulings. The fourteenth amendment was created to allow the federal government, including the federal Supreme Court, to intervene within states to protect the civil rights of minority groups. This is supposed to be a limited provision. The Alabama judge says that Alabama state law, or the constitution, defines marriage as a union between a man and a woman. He complains that the federal Supreme Court should not be trying to reinterpret the Alabama constitution — that the Supreme Court is overstepping the bounds of the 14th amendment. In particular, he is claiming that this is an issue of definition rather than an issue of civil rights. In this case, perhaps the Supreme Court is authorized to intervene, if it determines that LGBTQ people are within the purview of groups that are protected by the 14th amendment. Naturally, the 14th amendment does not actually mention LGBTQ people, so what the Alabama judge is saying is not so stupid as what John Oliver implies. The judge's statement reflects a longstanding feeling about state's rights, particularly in the southern part of this country. This is a legal concern. It is not an indication that election of judges is a bad thing. Certainly, if judges were appointed, it would not necessarily mean that they would make decisions that everyone would agree with all of the time. How can John Oliver think so? Now, I would like to comment on John Oliver’s contention that advertising during judicial campaigns is having a bad influence on judicial decisions. Many states do regulate what can be in advertisements during judicial elections. The types of ads that John Oliver shows would not necessarily be legal in all states. That aside, the alternative to election of judges is appointment. Does John Oliver contend that the appointment process is not vulnerable to corruption???? Not vulnerable to undue influence by public fears and general politics??? Does John Oliver contend that appointed judges are not sometimes found guilty of inappropriate behavior??? Those contentions seem utterly absurd to me. I wish I were not on vocal rest so that I could do a YouTube video, pointing out to John Oliver, in his own medium, the ludicrousness of those assertions. I mean, why are people not rolling on the floor, pointing at their TVs or computers, laughing at the stupidity of someone saying such garbage? Instead, this is a promoted Facebook video. In totalitarian countries, also, leaders do not trust the election process, do not trust their own people. It sounds as if John Oliver is sympathetic to that reasoning. One of the things I like to document on here is things that break. This is because I feel that in general merchandise in the USA is not of adequate quality and should be improved. What you see here is a basket from my Kitchen Aid dishwasher. You will notice that some of the cross pieces have broken off. This means that the holes in the bottom of the basket are too large and utensils fall through. When they fall through, they hit the rotor below, stopping it from turning. When this happens the dishes don't get clean. It may also be bad for the rotor. 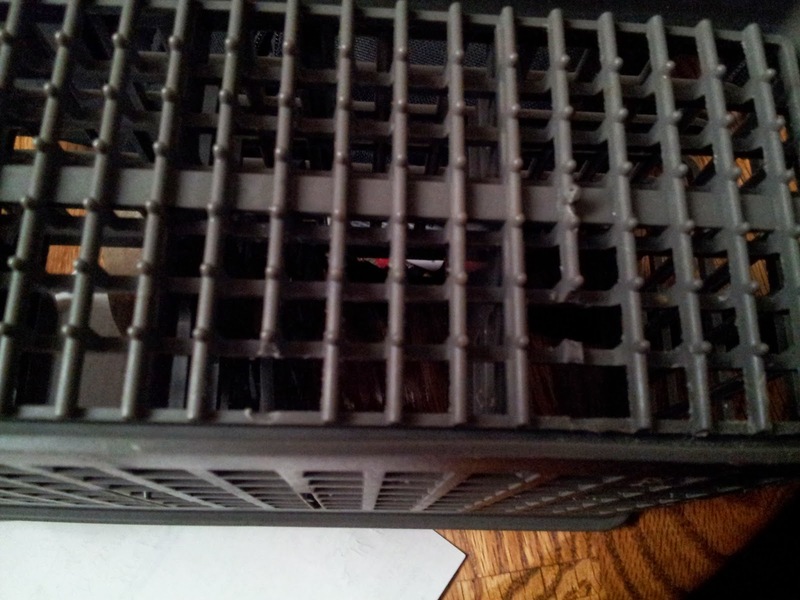 Cost of new basket: over $50, which seems very high to me for a plastic part like this. On February 14, 2015, I experienced a basement flood. Water was running out of the back of my relatively new furnace. I had to make an emergency call to my furnace contractor. 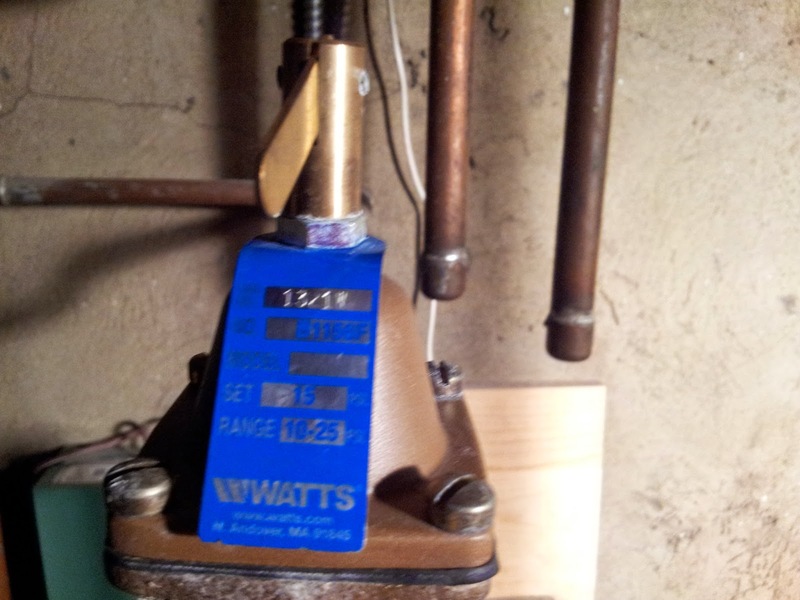 The verdict was that the feeder valve to the furnace had failed, putting excessive water into the system, and overstressing the relief valve, which then caused the relief valve to fail. Those of us who live in the USA are familiar with the general decline in product quality here. Whereas, in my parents' time, major appliances were expected to last 50 years -- and I do not remember any major appliance failure in my entire childhood, upgrades being done by choice rather than failure -- now appliances barely survive their warranty period, which tends to be short, generally no more than a year. This constant appliance failure is an unnecessary drag on the typical family budget -- not to mention a big stressor. Flooding the basement causes property damage in addition to repair expenses. Something needs to be done to return appliance quality to its former state. This widespread sale of hazardous junk needs to be halted.